Is there a difference between drip and percolated when it comes to taste? Coffee at home is not as good as when I purchase a cup...even from a gas station. Yes, there is a difference between coffee from a drip brewer and coffee from a percolator. If you use a quality drip brewer you will almost always preserve more of the subtleties of taste that are lost with a percolator. A percolator isn't great for getting the best from a good coffee, but it does make a great cup of Joe. A nice, strong cup of coffee. The only problem I see with a percolator is that the water is a little too hot when it hits the ground coffee. A little too close to boiling point. With pour-over coffee makers, for example, one typically waits 30-45 seconds for the boiled water to cool by a few degrees before pouring it over the coffee. That said, I have made percolated coffee often enough, and have enjoyed the result. The coffee has a rich, bold feel that is often lost, particular with cheaper drip brewers. So if you like strong, rich coffee, you may well want to try a percolator. One coffee percolator we can recommend is the Presto 02811 12-Cup Stainless Steel Coffee Maker . Comments for Drip or Percolated coffee...which is best? Ok let me try and clear it up for you better.Answer yes you need too wet the entire inside and outside of the basket before you put in your grounds.Now to tamp the Grounds I use a Square shaped Tablespoon measure scoop.But you can use your coffee scoop(See link)http://amzn.to/2Dww1fL And just press down the grounds! U don't need to pack it so tight the Water won't flow and you will get a very weak brew! Tip-give te basket a little shake after packing the grounds too let the water flow through. I actually use 3 scoops of Dark Roast ground for drip on the bottom or first.Then I use double or at least 5 scoops of Light Roast fine ground on the top and I have zero grounds in my coffee. Like I said every single person who tries my coffee Loves it! Theirs no question it makes by far the best tasting Coffee.The only thing remotely similar is a French Press, but their a Hassle imo! believe me if you use a paper filter in the Presto u may as well just use a drip machine! The whole point of the Perc is to avoid paper and get a True taste of the Coffee.Paper removes Cafestols and other Coffee extracts which hold all the flavor! Let me know if you have anymore questions or it didn't work right! Oh and good move buying the Presto! American Made Even! Filter or not to filter, that is the question. I have a Farberware Superfast percolator. Initially I used a disposable basket style flat filter in my percolator (pressed it in a popped a hole in the middle with the rod) but found I did not need it for medium and coarse ground. Recently I purchased a brand that was fine ground and some of the grounds did get through. You could use the filter for fine ground if that is what you prefer. Bought a percolator, now what? I read your comments below from 6/15/2017 about using even fine ground coffee in a percolator. I just bought the Presto 12-cup brewer and am setting up my first experiment to see if I can make something that tastes reasonable. I want to try fine ground first, but per your earlier post, how exactly do you "tamp down" the fine grounds in the basket? Just by compressing them with the scooper and having the basket surfaces wetted? I guess I'll just have to try to see how it works, because I'm not understanding how the grounds won't make it into the brew, and that doesn't sound too appealing. Scroll down to my post on Jun 15, 2017. U will see exact instructions on how to make the perfect Perc! 1.U don't need coarse grounds/Even fine works! 3.Never ever put Coffee in Fridge or Freezer! This was a myth back in the 80's that it kept Coffee Fresh! But it does that exact opposite! It dries the Coffee out twice as fast and Takes away flavor! Buy yourself a Coffee Container Like the Friis $14.85 on Amazon.Or if u need a bigger one 2LBs buy a Kilovac Also on Amazon for $22.99. Both of these are air tight! Leave the Coffee in the Bag! Oh and buy yourself a Grinder! U always want too Grind your Own Whole Beans! Much fresher and the taste is very obvious!Cuisinart DBM-8 is a good on for $37. It will last yrs! I hope this helps.Once again My June 15th post tells U how too make the best Percolator Brew for any machine! Please help me make a good pot of percolator coffee. I am not a coffee drinker, but I want to serve perc coffee to guests of my B&B or visitors (because I only own an electric percolator and don't want to buy something else). I wouldn't know a good cup from a bad cup of coffee. In reading the comments, I need to buy course grind coffee (Costco or grocery store that lets you grind your own)? Keep in fridge/freezer? What is the exact size of a coffee scoop as I don't have one; 1 Tablespoon? I have my mom's stainless Farberware Superfast, model 138, that make 8 cups (she has my 6 cupper). It has the SS strainer inside on a post, a plastic see-through top knob, and an electric cord. I think the issue is American-style coffee, which is pretty weak compared to how the rest of the world drinks its coffee, and so most Americans can't really handle all the flavors that are supposed to be in coffee. In Italy and other parts of Europe, the Bialetti Mokka Express, a simple, stovetop espresso percolator, is the most popular home coffee maker there is. I own one, one of the smaller models, that makes about 2 little demitasse cupfuls of coffee, and love it. When I first got it, I made a few bitter, burnt-tasting cups because I left it on the stove too long, but after a few tries, I got the hang of knowing the exact right time to take it off based on sound, and get a perfect cup every time. Also, a lot of the ongoing criticism of percolators, at least the electric ones, is based on way outdated information, as the thermostats on new models have gotten much better, and they automatically click into "warm" mode as soon as the coffee is brewed, so they aren't recycling it through the grounds multiple times like people think they are. I have a 40-cup Hamilton Beech urn that makes its coffee by percolation that I use for parties, and people rave about the coffee it makes, even though I find it weak compared to the Bialetti and it is more like American-style coffee. Between the good thermostat and brew control, and the fact that with such a big volume, the grounds are pretty far above the heat source, the coffee is generally comparable to drip coffee in quality, except a little bit richer in flavor. Plus for a large crowd, a big percolating urn is the best way to make and keep coffee without hiring a barista. I'm using a Presto 12 cup made in the early 80's and it makes the best Coffee I ever tasted. Also everyone who tries my Coffee is amazed at how good it is! U can find a Used Presto 12 cup on ebay! Don't be afraid of a used machine they last forever and u can buy a Cleaner called Dip it by Lime Away at any grocery Store or on Amazon and make it just like new inside! The Faberware is a good machine! I'd recommend the Presto 12 cup 1st.But both blow away any drip machine on the planet as long as u don't use any paper filters! I left exact directions a few posts ago! I have an old Farberware Superfast percolator and a Bonavita drip coffee maker and have been comparing the two with different coffees/grinds for a while. I get excellent results with both but generally find that the percolator makes coffee that is really competitive (but different in character) with the Bonavita's coffee, a lot better than most people would have you think. I think I've found the reason I'm getting such good results with the percolator compared to the drip coffee maker though. I live at 6000 feet and water boils at 201 degrees here, 11 degrees cooler than at sea level. That means that the water is cooler than it would be at sea level with both coffee makers by the time it hits the grounds. I've confirmed this with an electronic thermometer. This means that the Bonavita is hitting lower than ideal temps and the percolator is getting closer to ideal temps during the brewing process. I just wanted to share this for what it's worth. I recently found a Farberware 142 B Superfast electric percolator in a box of things my in-laws were getting rid of. I've been trying to recreate good old fashioned N.Y.diner coffee for years using a variety of different drip machines. Having no success, I decided to try the percolator. Was I ever pleasantly surprised. This unit was a shower gift back in 1965. It produced the best cup of coffee I have ever had at home. Fast forward to last weekend. My beloved percolator has finally succumbed to old age. I purchased an inexpensive Hamilton Beach model and returned it after brewing one pot. Flimsy construction and grounds everywhere. After spending the day running from store to store looking for a Presto or Bialetti model, I called it quits. My wife sensing my disappointment, quickly logged onto to ebay and found an identical Farberware model. Brand new believe it or not. It should arrive in time for the weekend. I plan on rebuilding the original unit and keep it in the family. Always nice to have a reliable back up. If you are a fan of percolators, you would be amazed how many older models are available out there. Trust me, you won't be disappointed. No Comparison! Follow these Directions! Theirs 3 important Steps that make all the difference! 1.Don't use any paper filter in a Percolater.Only use the Stainless Steel basket/filter that came with the machine. 3.Take the side of your Coffee Scooper and "Tamper Down" the Ground Coffee.ie make sure the grounds are not loose in the basket. Steps 2,3 are the key to not only avoiding any grounds in your brew, but also the key in making the best cup of Coffee you ever had! One last thing is using high grade Specialty Grade Beans, pref ground just before brewing always makes a better Brew, than using cheap store Bought Pre-Ground Coffee(IN the Cans,Containers etc..) Key as long as you tamper down the ground coffee it doesn't matter if your using a Fine Ground Coarse Ground,Drip Ground it always tastes better! My mother put a perfectly good percolator away to use the Drip coffeemakes. After she died, I found the percolator in the back of the buffet. It is a Cory Jubilee 4-18 Cup Automatic Percolator and it still works. You get more coffee brewed out of the grounds than with a Drip maker. If your Drip maker's just-used grounds still have the smell as the grounds before you brewed your coffee, then you rob yourself of a good, strong cup of coffee. With my percolator, after the brewing cycle is overeally and the grounds have cooled off, the grounds have more of a dirt smell with a slight coffee aroma to them. I have been using a percolator all my life. To me drip brewers just taste watery. Kinda funny saying then when most of it is water. I guess the percolator has a full body flavor. Someone asked about the grinds. What kind to use. Yes, you can use drip coffee (which is in about 95% of pre-packaged ground coffee) but you will have a lot of grounds in your cup, especially pouring near the bottom of the pot. That is because the grounds are two small and make their way through the metal filter of the basket. You can have whole beans ground for a percolator at most stores that sell whole beans. Another good option is to use paper filters designed for percolator baskets. I am not a big coffee drinker,but I do like to drink coffee sometimes. when I do I think back about my mothers coffee. it always tasted so good. she had a percolator. I was telling my son about this. when I opened up my Christmas present from my son it was a percolator. I cant wait to try it out. I am unsure which type of coffee to buy. do percolators use ground coffee too? When I was a kid 45 years ago, my mom perked her coffee in a cornflower blue Corning percolator. I had a percolator myself back in the 80s then finally went to drip. I have never been able to get that aroma of coffee being perked in the morning from a drip coffee maker, nor have I been able to get the wonderful flavor that a nice cup of percolated coffee provides. Recently my 3rd Mr. Coffee maker bit the dust, 3 within 3 years, and I said "no more" and I bought a vintage Pyrex 6 cup percolator from Ebay and I'm the happiest person in the world! I haven't had coffee this good in decades and I've forgotten what a good cup of coffee tastes like! No you don't boil the water in a percolator and you don't boil the coffee! Took me a while to remember but once the water boils, it's turned down to a simmer and one lets the coffee perk for about 10 minutes then the stove is turned off and the coffee rests for about 5 minutes to let the basket drain out. I put my fresh coffee in a thermal carafe and it stays hot for hours and hours without being heated and without any horrible burnt taste that make drip makers famously horrible. Coffee used to be sold by how coarse the ground was, "drip" "perk" etc., but now it's all the same so I use a strainer while pouring it in my thermal carafe to make sure there isn't any coffee grounds in my coffee. I had been using Eight O’Clock coffee, only 100% Arabica coffee for me, but I found Mc Café by Mc Donald’s, 100% Arabica as well, it’s a few bucks cheaper and VERY good coffee! Used drip for as long as I could remember and was always satisfied. Moved to percolated a couple of years ago and I couldn't be more pleased. Now I truly enjoy my coffee, bold, strong and tastes to me what I think coffee ought to taste like (I spent a year in Italy and I mostly missed bagels and American brewed coffee). Added bonuses that it's cheap, it doesn't require a filter and its sturdy. I have heard that perks can burn coffee. I suppose it can on a stovetop if you aren't careful, but my cheap little Hamilton Beach electric perc hasn't burned my coffee yet. by: Kathy K., Belleville, IL. on...was not happy my Mr. Coffee went out, but allowed mento try my mom's stovetop percolator!!! Perc is best...hands down!!! Turkish coffee destroys them all, in my opinion. It's the oldest method to make coffee too. Can't go back to anything else now... But I do like drinking a good cup of espresso as a second resort. We have an expensive drip machine at work, but I use a percolator at home. I prefer the percolator. Taste is subjective. If you are used to the taste of drip coffee you may not like the taste of percolated. I switched to drip years ago-sorry day, sorry day!! No matter how I adjust coffee for the drip (they were not cheap models either) coffee makers the taste is not as robust as it is from the percolators I owned. Even the aroma from a percolator is more aromatic than from a drip makers. I have even tried the single drip versions-even worse. The coffee is weak and lacks real coffee aroma Therefore, this weekend I am tossing out the drip and buying a real coffee maker-a percolator. I have always enjoyed a good cup of coffee and purchased a single cup brewer machine. Long story short, I don't care for the weak coffee, high price and that they don't last. My XMas gift to myself was a percolator and arrived yesterday. Best coffee decision EVER. Oh how I have missed quality coffee. I have a hard time telling the difference between my french press and percolator when using the same amount of water and high quality beans. One difference I do regularly notice is that percolated coffee has a certain velvety smooth quality that I don't find as prominent with other brew methods. There is just a unique consistent smooth complex richness to it that I don't get with french presses or pourovers. One misconception about percolators is that they boil the water. Stovetop models can boil the water (if you're not careful), but my electric Presto keeps the water in tank about 190 degrees in pot when finished (I measured with a candy thermometer). Quality pots will percolate before boiling is acheived, and I believe that by the time the water hits the grounds, it is within the range of 200 to 205 degrees. Claims of over-extraction occuring with percolators are just not true in my experience. In addition, I believe that percolation gives one other added benefit: increased oxygenation which aids in brewing. When the water spurts up and then drips through the top of the basket, through the coffee, and then again through the bottom of the basket (and for some of the mixture this is repeated as the water cycles), I wonder if this is adding free oxygen that aids in brewing. Or perhaps this oxygenation happens as the hot brewed coffee falls into the cold reservoir water). I'm no chemist, but there is something special about the percolator, and there's got to be a reason for it. Editor's Note: Excellent feedback Zach. Thanks! I inherited my grandmother 's drip o later and it came without instructions. Anyone who know how to use a drip o labor, I would appreciate it if you'd share your knowledge. If your looking for truly old fashioned coffee pot for stove or campfire. Go to Cabelas.com they are called the greatest outfitters for a reason. They sell two styles under their name brand. Whether your making a cup on your kitchen stove, or on Coleman stove or campfire those models are great! Got a blueberry cake recipe. Really old.. New England. It has been a very long time since I had perculated coffee and just had my first cup, delicious flavor. What a difference in taste from drip. I bought a stainless steel Faberware for my gas stove and I am so happy to have done the switch. I want to thank all of you for your comments because it gave me insight and answered some of my questions (ex: coarse grounds for perculator). Boiled water is too hot for "perfect" coffee. That is the one drawback for perk. Theoretically, drip WOULD be better, IF there was a machine that has ZERO plastic anywhere coffee or water flows, AND could last more than 2 years. Bring On Granny's Steel Percolator! Add me to the list of the converted! OLD steel percolators (NOT THE NEW ONES!) brew fabulous coffee just as fast as drip, with NO BOILED PLASTIC to ingest, AND they will continue to last for decades. If any parts wear out, they are easily replaced. Even better, buy BEANS, grind it COARSE yourself, just before you brew. Coarser than drip, not as coarse as "French Press" grind. I've tried just about every possible way people around the world make coffee, and enjoy being open to different methods. I think it's a great way to know a new city or country. When I order coffee around my home, I like regular black coffee. I'm simple, and never get caught waiting for a drink with my name from a barista. However, many popular coffee chains make terrible coffee. Even though they grind it and put it though a fancy machine, it tastes acidic and burnt. I've also noticed over the years that home drip coffee makers taste like plastic and all around weak. I started researching drip-alternatives for my house, and was surprised to see many percolators being advocated. I was always told they "boiled the water and ruined the beans, leaving a bitter taste." Blah Blah...it's all bull. I received a vintage 1960's 4-6 cup Pyrex Flameware stovetop coffee percolator for my birthday, and I am truly happy with the results. after a small learning curve with this method, I can keep an eye on the entire brewing process through the clear borosilicate glass while controlling the flame to keep it between 195 and 205 with a standard chef thermometer I stick though the spout (reaching toward the deepest water). What comes out after 6-8 minutes is a very smooth, rich flavor that will surprise any drip lover into eating crow...and the best part, NO PLASTIC TASTE like you get from the drip machines. I am sold on my percolator for life! Best damn coffee I have every drank, and while it may be a bit laborious compared to modern auto drips, it's a time-cherished labor of love well worth the little bit of extra cleanup. A drip coffee person of many years, one day I was cleaning out my mother's basement and came upon a lovely Universal Coffeematic from the 60's. It was so beautifully shaped and sturdy it just captured the "essence" of a coffee maker. It had no electric cord, but I found one on Ebay for a few $. This percolator makes the most amazing cup of coffee!! After a few pots I got the exact right strength and enjoy a perfect hot cup every morning. No more wasted paper filters. To the ghosts of Coffeematic which is no more, thanks so much for the beautiful thing you made. Drip coffee does not hold a candle to it. I'm not a "coffee snob." Never spend the bucks at Starbucks, prices out of this world. (thus Starbucks?). I just made that up. My wife broke our Mr coffee drip glass pot. Mom in law gave us an old perkolater...it RULES. As I write this, I am drinking a delicious cup of percolated coffee from my beautiful art deco glass top vintage 1950’s Farberware percolator. I purchased it because it reminded me of the wonderful homey aroma and sounds that emanated from the percolator my grandmother used while making breakfast. The flavor of my Vintage is far superior but because of its age, I have only used it on occasion. For daily use I have a Mr. Coffee drip that has lasted so many years, I forgot how long I have had it. Recently I broke the glass carafe on the Mr. Coffee. I was deliberating between either finding a replacement for the carafe on eBay or purchasing a brand new coffeemaker. After much research and reading many reviews, I realized that the new coffee makers do not last that long – even the expensive ones. Plus there have been complaints about the plastic taste in the coffee. When checking them out in the stores, the plastic seemed more flimsy. 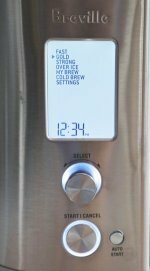 I was not interested in a programmable as I don’t drink coffee at the same time each day. I happened upon this article and thanks to the overwhelming reviews in favor of percolators, I just purchased a Farberware Superfast Automatic Percolator on eBay for daily use. I also decided to purchase a replacement carafe for the Mr. Coffee on eBay since it still works which I will store. Thanks again and happy percolated coffee drinking! A friend tipped us off to going with electric perk about 2 years ago and we love the taste and temperature. We start our day very early and were used to setting the timer on the auto-drip so I plug the electric percolator into a timer at the wall outlet and when we get to the kitchen the coffee is ready. Our only problem is that the percolators only last 6 months to a year with daily use. We have had 3 different brands and this morning the West Bend heated the water, but didn't perk,the coffee. Not all percolators are made of aluminum.I have a sunbeam AP20 from the early 60's it is constructed out of copper and chrome plated on the outside and nickle plated on the inside. 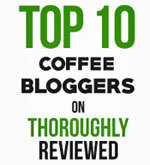 I think with all the positive comments on Perced Coffee, all these people can't be wrong ! I forgot to add that there were concerns that aluminum presented itself more with acidic foods like tomatoes or coffee. I would love to get a vintage Sunbeam or GE electric percolator - but don't all vintage coffee pots have aluminum linings? Another poster here said he wouldn't drink coffee from these pots because of the aluminum and the risks. Any thoughts on this subject? I use a Faberware stovetop percalator every morning. It takes longer, but is arguably better. I am naturally retro. There is an advantage. When the power went out during the last snow, I just pulled out my gas stove and did not miss a single cup of coffee. Real he-man survivalist prepper types prefer percalators. Much more masculine. I also like the stovetop european coffee brewers, but I keep those secret. European espresso coffee has a marxist Che Guevara feel to it, and any real American will avoid being corrupted by espresso. I will admit I whipped that thing out to the delight of some Frenchies who visited me a few years back. They said my stovetop contraption was how their grandparents made coffee. But I am all about the 1950's style real Americana percalator. It is a bulwark against communism and socialism. Great for lone prairie types. I was recently browsing for old books in an antique store, and came upon a vintage 1960's G.E. 4-slice toaster, still in the box, never used, made in the USA. I bought it for $15. That got me to thinking about replacing my ailing Mr. Coffee machine with a vintage percolator. For years I had my grandmother's old GE percolator, but after almost 40 years, it gave up the ghost. After several years of various and assorted drip machines, I have reverted to a vintage Sears 12-cup percolator I found on e-Bay. I can't wait to hear the age-old sound pf coffee percolating again! I am increasingly less and less impressed by all the "gee-whiz" high tech stuff being thrown at us today, especially since most all of it comes from China. Nevertheless, I'm grateful that well-made, American-made vintage products are still available. I love my electric percolator. It beats Keurigs and drip machines hands down. I have both of those coffee makers sitting in my garage now. I disagree that anything is "lost" in perc coffee as far as flavor. But my favorite thing about an electric percolator is that you get a truly hot beverage and not a lukewarm one. I love percolated coffee, however, I also have a little ceramic pot with a ceramic paper filter holder which one pours water over the beans to brew coffee, and that makes great coffee. I cant stand automatic drip, and/or French press methods, to me they are the worst ways in which to brew coffee for various reasons. As much as I have always loved percolated coffee, the pour over drip makes a superior cup of coffee. The best coffee is a perked cup.I have my Nanny's and Mum's pyrex coffee pots.The trick here is to add a sprinkle of salt to the coffee.They always did.It gives it a smooth flavour...Please try it!! !I threw out my coffee maker. "Editor's Note: Busted me! :) I've actually been trying some percolate[sic] coffee. I love it for a good brew. But still wouldn't use it to get the very best out of a high quality coffee bean". I'm not so sure of that, of course everyone has a right to his/her opinion, however, if ever there was a 'coffee snob', without a doubt it is me! I roast my own beans, (green beans mostly from Sweet Maria's), I've had/have quite possibly every conceivable way in which to brew coffee. To me the worst are the press, and auto. drip methods. Like most things there is a learning curve, once this curve is straightened out in coffee brewing, for me there is no way better than perked coffee. I finally got it down to using an old Farberware SuperFast for me, that is the best. Also, with perked coffee less beans are required, and seeing as how my beans cost a small fortune, less beans for a better 'cupa-joe' is a winning situation. One thing my parents taught me about buying a perk is stay away from GE, they make the lousiest coffee ! Stick with the West Bend Brand, you can't go wrong ! I would personally go out on ebay and you can find a New Old Stock ( NOS ) or a lightly used one really cheap, and you can try it and you're not out that much if you don't like it. But I don't think that will be the case ! Go for it, they're usually around $20.00 ! Does any one know what the mild-strong knob control? Does it control how hot the element is or how hot it gets before units shuts off. Mine is brewing for to long and trying to figure it out. Coffee Detective seems to have changed? I've been following this blog for several Months, and it seems as though the Coffee Detective has changed his review/post. Perhaps he/she read all of the positive statement written about the best coffee ever (IMO), wonderful percolated coffee. Editor's Note: Busted me! :) I've actually been trying some percolate coffee. I love it for a good brew. But still wouldn't use it to get the very best out of a high quality coffee bean. Coffee Dective is greatly mistaken! The best coffee ever, and the way in which many Central/S.Americans brew coffee is by percolating. If convenience is something that is important, and perhaps one of the reasons a person chooses to use the horrible drip method, simply get one of the old Farberware Superfast electric percolators. They are as their name states, fast, and one gets the best coffee ever...percolated! I've tried just about everything associated with making coffee over the last 30 years, short of using a professional 20 or 30k café machine or maybe a properly operated cheaper domestic dual boiler machine, the gas stove top flame heated percolator wins hands down ! She who perks is not a jerk. The Keurig/one-cup coffee makers are just kitchen counter "bling" that scream "looky-here, I can afford this". Coffee in it's best form is percolated, or made on the stove manually... a daily custom for many Latin families. The GE electric perk pots from the 60's and 70's are my favorite. I set them on "strong", and mix Cafe'Bustelo with a milder ground coffee... the best coffee ever. And for a real treat.... use a few ice-cubes in the water before you brew. Somehow starting with ice-cold water, the coffee comes out even better. Who wants to drink coffee that has only once slid through the flavorful grounds??? I'd been using a cheap drip maker with paper filters. I found a Farberware Superfast percolator in the cupboard and started using that. I love the coffee from this thing! I find the flavor to have more pleasant nuances to it than filtered drip coffee. It's more satisfying. I really enjoy that morning coffee now. I actually just searched on "Who likes old time percolators" and found this site. I might buy a vintage percolator to give as a gift this Christmas just to spread the word. I only recently started using an electric percolator and I love it. I found that automatic drip did not heat the water enough to extract the best from the coffee. The percolator coffee is warmer and more flavorful. My home coffee was always drip or a french press for years, but I always liked the taste of the stuff my parents and in-laws brewed in their percolators. As stupid as it sounds, I believed what I read and avoided a perc. My MIL bought me a cute little 8-cup percolator for Xmas a few years ago and it's become my favorite. As soon as I see that the brewing has started, I turn the heat almost all the way down and give it 6 minutes. Drip coffee is a drip! I'm old enough to remember when drip coffee makers first came on the scene; and let me tell you this; no one I knew liked them! They started becoming popular due to lying, deceiving sellers stating that percolators "boil the water/coffee"! Yes, a stove top percolator CAN boil the water...IF you don't monitor it, and simply leave the percolator on a high heat...like a complete moron! It seems as though the sheep of the world love to love that which is popular; drip is popular, drip is the best to the sheep; press is popular, press is best to the followers etc. Humanity has lost its ability to think, and to use logic. Percolators BOIL coffee? [should be boil water]. That sort of thinking could only come from the mind of one who believes the fairy tale of a man living inside a fish to be factual. Sorry, but you are merely another parrot. I have several percolators, one of which is an old GLASS percolator from the 50's. I'm able to visually see when the coffee starts to percolate in my glass percolator. The coffee begins percolating way before boiling! It starts to percolate during the simmering stage..NOT BOILING! So, if you percolate coffee using a stove top percolator, (which is my favorite), simply lower the heat way down as soon as you see the coffee begin to percolate. Those making the moronic claim that percolated coffee BOILS the coffee, to reiterate...mere parrots! I have/had every way of brewing coffee you could imagine, that is not a mere conjecture, that is a FACT; the best tasting coffee is still percolated coffee. I hated always replacing a drip and the coffee tasted weak. I got a French press and the coffee is great but it only makes a small pot. We picked up an electric perc about 6 months ago and love it. The coffee tastes great and it is just as easy and quick as a drip maker. I'm not sure what free floating oxygen is, if the water had an extra oxygen it would be Hydrogen peroxide. The best coffe I ever have is the stuff made in a percolator over an open campfire. All those coffee snobs out there are really missing the good stuff. Percolated and stove-top brews are the best, and I've tried every method there is. I've bought and gotten rid of countless drip pots, French presses (the one I disliked the most), vacuum pots, etc, jut because the coffee was always either, bitter, tasteless, or too acidic tasting. Didn't matter what brand coffee, or how little or how much I spent on it. Then one day I found an old Folgers coffee can from the 1950's that somebody had made into a (very cool) lamp, which gave instructions on how to make coffee on the stove without a percolator. I tried it and it was awesome! 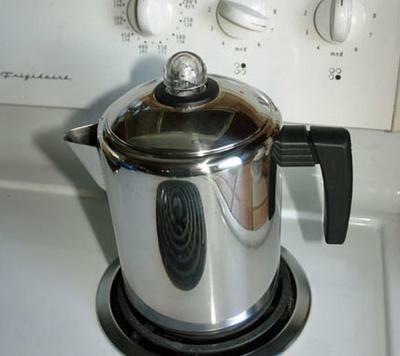 Some time after that, I saw a Corning Ware electric percolator at a thrift store and decided to try percolated coffee because I remembered how good it smelled when I was a kid, (plus I liked the sound it made and watching it shoot up into the glass bubble). I was hooked! Since then I've collected several (vintage) percolators, which I alternate using with making stove-top coffee, which is easier on the clean up. They all make phenomenal coffee, plus they're great for perking spiced apple cider in the fall and winter, using spices in the basket. Yes, although it is 100 degrees in TX and I am not drinking much coffee right now. The little inherited perculator has become my "go to" coffee maker. The comments about the loss of flavor while using a percolator display a lack of knowledge of physics. Just take your comments on percolators and reverse them. You concentrate the flavor with a percolator, you don't boil it away. It just sounds like the comments of someone justifying being too lazy to perk. Actually percolators do not boil the water; they heat the water up to 195-205 degrees which is ideal for making a good cup of coffee. Most drip coffee makers, in my experience anyway, do not get hot enough to meet this temperature. Now the ones I used were maybe 5 years ago so I would hope the newer ones have been modified to fix this issue. The other big factors include the quality of water and the grind of the coffee. Coffee gets its flavor and aroma during a process called extraction when the hot water passes through the ground up beans. If this happens too quickly, the coffee will be weak; if it happens too slowly, it will be bitter. The speed of this is decided by how fine the grind of the coffee is. I also find the stainless steel percolator does not affect the taste of my coffee like plastic drip coffee makers do. Used a 4 cup drip for years, thought I'd upgrade to a single serve HB Scoop model - once it arrived I couldn't get a cup of coffee without the plastic taste - tried running many cycles of water thru the machine - still no success. Packed it up and sent it back. Did some research re percolators and thought I'd give it a try. Found a 4-cup electric Farberware model and ordered it online. I cannot believe how much better coffee taste using this brewing process. Old tech, gotta love it. Of course, this is my humble opinion. I have experimented with different methods and different grinds for some time now and it seems that you just can't seem to beat the old fashioned ways of brewing coffee for flavor. The best I have found is a method commonly referred to as cowboy coffee, which is kind of similar to perc. It is the oldest and simplest form of brewing. Simply course grind the beans and cook in water just below boiling on the stove for a few minutes then pour thru a strainer. This allows for a strong yet smooth cup of coffee. This is the only method I use now. I have thrown away my coffee makers! Your best bet is just look on eBay and you'll find some New old ones out there or gently used ! Personally I think the best brand is West Bend, they still make the big 30+ cup perks the restaurants use, that's right your favorite restaurant coffee was more than likely made in one of those and then they filled up the glass pot ! You can find a brand new one ( 9 cups or less ) for $20 and free shipping, enjoy ! re electric perks hard to find? nope. prior comment mentioned that electric percs were hard to find, easy to find at Walmart (which I hate since EVERYTHING, I MEAN EVERYTHING is made in China, NOT DOING THAT!!) or target, or even Kohls. Presto has 2 as does TFal, both are 12 and 6 cups; the Presto 6 cups is REALLY small, the cups are probably measured as 4 or5 oz thus making it only 20 or 24 oz., the other is measured in (I think) 6 os cups, thus making it 36 oz. Easy to find, really. And Amazon has many, as does Sears, on line. riley, elgin il. We have always loved our percolators, but got an automatic 1 cup maker for Christmas and got hooked on it--so much fun that I was drinking far too much coffee a day. Also, I noticed that my GERD acted up frequently, making me quite ill. So I will be going back to my the perc. I have an electric perc (hard to find but they are available online) but for good stove top percolator, I have one I got from LLBean. They come in 2 sizes and they are great! Back in college what started as a discussion on this topic turned into a debated then an argument. So we decided to set up an unbiased taste-test following the rules of scientific experiments as best we could. The results were overwhelming in favor of the perked coffee, although the drip still did manage an overall "satisfactory" grading. Some of the die-hard drip defendants were genuinely shocked. So I pulled out a cute perculator I'd inherited. Did not understand how to put the pieces together correctly, so my coffee buddy and I had grounds everywhere. It tasted wonderful. The second pot, I made sure to include the basket cover. It's even better and my little perculator just makes 4 cups. In a month, I wonder if I will still be in awe of the flavor enough to deal with coffee grounds. Oh wait, the coffee grounds are a bonus for my compost heap. Well, I understand what is being said about boiling water. When making a good cup of tea, weather tea, or herbal tea, you don't want to actually get the water TO boiling, you want to stop the process just before. Well, when you boil water, you remove free floating oxygen from it. This FF Oxygen, is what helps the water brew the tea leaves, and liberate the oils that make the tea. You can still get a product, but the steeping takes longer, and the taste is slightly different, flatter somehow. Being said, I don't find quite the same thing in coffee. Honestly, I find drip coffee, to be weak, and inferior, but then that is a matter of MY taste. I personally choose either a french press, using the same water principle, not quite to boil, or prefer Perk in my 9 cup 1970's corning stovetop. One tablespoon per cup, a dash of salt to soften the water (like many diners), and 6 to 10 minutes after first perk. I even sometimes add roasted chicory I grow myself. When people say that percs BOIL coffee they are wrong. Boiled water never touches the grounds. The grounds sit about half-inch above the water, even as its boiling. Its elevated in the basket. New electric percs have the same new technology as drips; to shut off when done, adjustable brew strength, adjustable levels/cups wanted, even programmable start times. Giving out old, worn out info just means people are either not informed of new 21st century items, (check out amazon or Sears) or so hate percs makes me think they have mother- issues that need addressing on the couch! Do your homework before making blanket statements that are not accurate please. M riley.il. Percolated coffee is by far the premium method! Yes, you need to adjust the flame (after you can hear pre boiling) for a perfect(water temp)slow brew. Once you go old-school...you wont go back! I wish there were more "stove top" percolator choices available! Has anyone found a good store or online resource? There are quite a few disadvantages to drip coffee at home. One is that you are making the equivalent of coffee tea. The beans are soaked like tea leaves and then you have fairly weak coffee, unless, of course you fill the basket high. Drip coffee manufactures are not fools. They sell even at the highest level drip makers that will last from 3 months to, if you are danged lucky, 3 years. Even the high end ones do. I know. I dripped coffee for years and found myself buying drip makers quite a darn lot. I even paid for the deluxe $150 kind. Lasted a year. Percolators last for decades. They cost usually from $45 to $55. Mine has been going now for 21 years, ever since my expensive dripper broke down. Perking brings out the coffee's bouquet. The aroma that people remember when smelling coffee from percolators was the result of what the French call "nose." You taste with smell, too, and perked is far superior than coffee tea. You needn't mind too much about grounds. Even drippers don't want them too fine. Percolators can take any cut of beans a brew (brew, not drip) a cup of good joe. Perc coffee won't be "boiled" it you pay attention & keep your heat adjusted properly. I use drip machines (or stove top dripolators at home), and a small 3-cup Rapid Brew percolator out in the field. Percolators aren't "set it & forget it" devices. The big complaint about Perc. is the use of boiling water when the experts say it should be 195-205 degrees. Well, this assumes water boiling at 212 degrees. This is true at sea level, but not at altitude. Where I live the elevation is about 4,000 feet. Depending on the barometric pressure, water boils somewhere between 196 and 206 degrees. Thus, where I live the Perc. method can produce coffee as good as the $300 drip machines. Percolation allows hot water to rise over the basket and then rain on the grounds. The grounds are coarser, therefore less sediment enters the solution. The basket's bottom should be about 1/4 inch above the boiling water. Nonetheless, both methods(percolation and drip) are secondary in attaining the full-bodied yet mild flavor of a delicious cup of coffee. The grade of coffee bean is primary. If you've ever tasted the highest premium grade of coffee, you know what I'm talking about. I believe that percolated coffee is the best. I can't stand the new one cup instant tasting coffee. I also drink my coffee without any sugar or cream. The aroma and taste of fresh percolated coffee beats the drip type. Hello!! Even with a drip brewer your grounds are in contact with near boiling water during the entire brew cycle. Percolator hands down for coffee. The coffee detective, or Barney Fife, must be paid by the people who want to sell you a coffee maker several times in your life. Not by the people who want to sell you a coffee maker that will last for decades. He also wants you to drink bland, unflavorful coffee instead of rich, full bodied coffee. He even advertises machines on the web site. Coffee detective should be locked up for pedaling misinformation. BOOK EM' DANO!!! Percolator has it by far. I'd say the coffee detective is not much of a sleuth. Anybody (see the comments to the 'drip coffee is better' ) using both go for the percolated coffee over 85% of the time. So tell me, where does the Coffee Detective get its facts? A percolator is great for making a regular cup of coffee. I use one myself sometimes. But if you want to get serious about tasting the finer flavors and nuances of quality coffees from different parts of the world...in other words, if you want to taste coffee the way a serious wine lover tastes great wines...then you'll need to use a quality drip brewer like the Bonavita drip brewer, or a pour-over method like the Chemex. I bought a Farberware Stove Top Percolator last spring and haven't looked back. In doing the research on which one to buy, I couldn't find one derogatory comment on the flavor of the coffee from any percolator. Some people thought they weren't as quick or simple but as far as taste and aroma of the coffee brewing, I couldn't find anything bad. I think when you read something bad about a percoloator, it's being written by someone who has a stake in selling you another drip-o-matic or the filters. It's a never ending cycle! My stainless steel pot and glass viewing thingee on top(after market, I hate plastic), will be around long after I've been turned to dust. Soooooo, throw away the plastic contraption and get back to cavepeople coffee! It's AWESOME!!! Percolated coffee has more flavor, pours from the pot much hotter than drip, and just looks cool sitting on your counter. Not to mention the delightful smell and sound of it percolating. Amazon has a nice selection of modern percolators, and eBay has many vintage pots for sale. You can also find those high quality versions from the 40's, 50's and 60's at estate sales, yard sales and antique shops. Gorgeous. And what a cup of coffee!! Our drip coffee pot is going out. I decided to return back the the eletric percolator coffee. Such a wonderful smooth flavor. This is my favorite because it is made of nothing but glass and metal, you can use it even when the power goes out, and you have complete control of the whole perking process. I start with hot water from a kettle, pour it in the percolator pot, place the stem and the basket full of coffee inside, put the lid back on, turn the heat to Medium-high, wait for the first blurps of liquid to splash up and into the glass top, and then SLOWLY turn it back to Low, taking care that the bubbling never gets too slow or too fast. This will keep the temp of the perking liquid a little bit below boiling. Then after it sprays into the glass top and drips down through the spreader, it is cooler still when it finally touches the coffee. So, I disagree with those who say that the temperature is too high with a percolator. Of course, to get this right with the stovetop, it is more labor-intensive, but it is definitely a labor of love. Then there is the joy of watch the water through the glass gradually turn into coffee. It's beautiful. And the smell... ahhh!!! I usually let it go for 10-15 minutes for a really strong, hot cup of coffee. I boil the water first, and then after it boils I take it from the stove and pour it into a large carafe that has freshly ground coffee in it. then I stir the coffee/water mixture and after a minute or two (and another quick stir) I pour the mixture, grounds and all, into a drip cone. I like the coffee that comes out. Can anyone see potential taste problems with that method? Isn't that kind of duplicating what a French press does, except with a finer filter and letting it drip instead of pressing it? A couple weeks ago, the little plastic topper on my electric percolator busted. I had to use the little 4 cup drip that I use for the camper (mostly for tea, soup, and oatmeal). I am finding that even though I use the same coffee, same amount of coffee, and the same filtered water, the drip coffee is just bitter. UGH! Now I need to add more sugar to compensate. I will be getting a new topper for my old perc! Perked coffee is so much better, i can't believe people think drip is better. I have yet to find a coffee maker that is drip that really produces a great cup of coffee. We bought a large percolator for a dinner party for a Christmas party that we hosted. The son of our dear friends boasted that percolated coffee does not taste as well as drip and that he should know, because, aside from his masters in English history, he worked as a barrista. I took him on the challenge. We had drip and percolated. Overwhelming the crowd chose the percolated; being smoother and more flavorful with a nice comforting aroma. It stands for reason. Percolation is a time honored way to remove solutes from plant sources. The trick is to never have boiling water touch the bottom of the filter. That is what causes bitterness. If you "boil" coffee on your stove top, yea, it'll taste like crap! The optimal water temp for a great cup of coffee is around 200 degrees. If you know anything about the laws of thermodynamics you know that air, as well as water, rise through convection. The "cold" water in the pot is heated on the bottom and forced up through the percolator tube in the middle and it DOESN'T NEED TO BE BOILING TO DO IT! 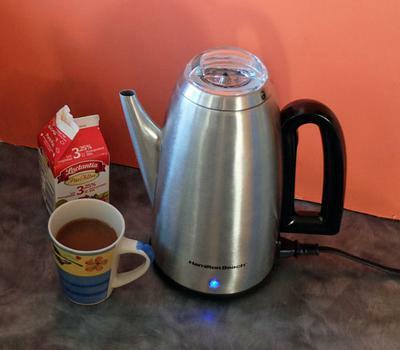 An electric percolator has a thermostat that keeps the water from boiling just like a drip coffee maker does. If you have ever taken the time to watch a percolator work theres NOT a lot of steam rising from the machine, THIS WOULD INDICATE BOILING, and would also indicate a faulty thermostat. Another misconception is that "the water is in constant contact with the coffee". Sorry, not so! The water that has been infused with the coffee is already hot and stays on the top as the cold water on the bottom is pulled up thru the tube. The percolator stops perking when the temperature inside the tube is equal to the temp in the pot. The basket containing the grounds IS NOT in constant contact with the water! It is, if you're stupid, and over filled the pot. YES, some of the infused coffee/water mix is "recirculated" through the grounds. However, that, IMHO, is what adds to the flavor of the coffee and makes a better cup than a drip coffee maker. Also. . . Many drip coffee makers work on EXACTLY the same principal as a percolator! if the water resevour is the same level as the pot how else does it get up to the basket to drip into the pot? Do a little "detective" work and uncover the mechanical principals of the old outdated percolator! 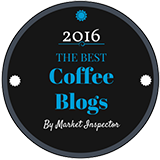 It is the consensus of contributors to certain coffee forums -- Coffee Detective, for example -- that percolated coffee is better than drip. The contributors to some *other* forums believe that *drip* is better. How do you guys rate French press coffee? In 1975 I received a Farberware 8 cup percolator which was "superfast" at a cup-a-minute brew time. Through the years I 'modernized' and went through many auot-drip machines, having followed the fashion started by Mr. Coffee. About 10 years ago I came upon a like-new circa 1970's Farberware at a garage sale and have never gone back. I might add that just last weekend I gave a vintage (made in Brooklyn) 4 cup Farberware percolator to my stepdaughter (who is an ex-Starbuck's manager), when we celebrated a late Christmas. She was thrilled and maintains the percolators are far superior for flavored coffees especially. I can't say about that because I don't like flavored beans...I can say that since 2006 I have bought 7 vintage Farberware Superfast pots on ebay and at church sales and they are all in daily use by younger people who once thought drip coffee was the only way you could make it. To each his own, right? Just because technology is introduced, doesn't mean it's better. I prefer my Pyrex glass peculator. 1. Less coffee is used with a percolator. Drip coffee makers require more coffee (one of the main reasons coffee manufacturers push the drip method). 2. Percolated coffee is hotter. I have tried many, many drip coffee makers (from the high end ones to the sub-$100 ones) and my main complaint was invariably concerning the temp being too cold. 3. To me, percolated coffee just tastes better. The flavor is richer (albeit somewhat more bitter with certain brands of coffee) and the temp is hot enough after adding a little cream. The only drawback to using a percolator is they are a little more work to clean up (not much) and if you dont use a filter, there will usually be some grounds in the bottom of the pot (which I avoid by using a small paper filter with a small hole pierced in the middle for the tube). It is really a matter of personal taste based on the flavor and smell you get from the amount of time the water is in contact with the coffee. Percolators can be timed to produce the desirable flavor and taste and so can a stove top drip pot. Both produce a far hotter coffee than electric machines because the electric machine makers are afraid to make coffee makers that get too hot because of liability issues. Find one or several methods that work for you and forget about what the coffee snobs preach because it just their opinions, too. I had a mid-level Bunn that finally bit the dust when the hot water tank started to boil itself dry instead of going through the drip basket one hectic morning. I had just replaced all the tires on my car, so the budget was a little tight. I remembered a Farberware Millennium 12 cup electric percolator I had received as a wedding present, and hauled it out of the cupboard, hooked it up, and what seemed like five minutes later, had a great pot of delicious, strong but mellow coffee. So I disagree that dripolators are better. My percolator has replaced the bulky counter-hogger. I don't mind waiting a few minutes for my coffee if it tastes so much better. Anyways, I think that if the brief wait bothers someone so much, chances are they're already drinking way too much coffee! Perked coffee brings back great memories. I was married in 1975 and received a Farberware electric percolator for a shower gift. Used it for a few years until it died or I decided to become modern and use a Mr. Coffee. For about 30 years I used drip coffeemakers (ranging from the least expensive to the expensive one with all the bells and whistles). Recently, my most expensive one died after about 7 years and I decided I was tired of it taking up so much space on my kitchen countertop. I decided to go back to the Farberware electric percolator and am delighted with the delicious smell, taste and nice hot cup of coffee. We drink it fast so it doesn't have time to get old and stale. Reminds me of Friday nights back in the 1950's and 1960's when my mother got together with her sisters and there was always a pot of coffee perking and an fresh coffee cake. Not going back anytime soon! After years of figuring out how does one make a great cup of coffee... I had a group discussion with my 'restaurant relatives'...some say its the coffee, some say the cup, some say the brew....final answer is the temp of the water is key and you get that by using an old fashioned electric perculator! I bought an old Presto at the Brimfield Antique Fair for $5 and I tell you I get the best cup of coffee ever! Hot and full flavor...house smells great too! The black and decker drip is now marked for the tag sale. my daughter recently offered to buy me a machine for my birthday, but the kitchen I have here in this apartment, you cant place too much stuff.So at local canadian tyre I saw a stove top perc and remembered when I used to visit my brother in the caribbean, he used to have a perc on the stove in the mornings, and that heavenly smell.Just gorgeous.So I thought, why not, that is the old fashioned way.Even coffee growers, thats how they made their coffee, not drip. who better to know how coffee is made and drunk but those that grew the stuff; and I havent looked back since.One to two cups a day and I am 'filled'.Didnt they say recently that coffee has many health benefits.Years ago, they used to say its bad for you.Dont pay attention to all those experts.They change like the wind. "...In other words, percolators just boil the flavor out of your coffee." Of course a percolator boils the flavor out - out of the bean and into the hot water. This is what it is supposed to do. More flavor goes into the water than with a once through drip. This is why so many people like percolated coffee! It tastes better because it has more taste. How does recirculateing water over ground coffie take out the flaver?!! Traditionally the purpose of perk pot is for stronger bolder flaver. It's more economical because all the flaver is extracted and you get more coffie out less grounds. Every drip coffee maker I've ever owned brewed lukewarm coffee. By the time you added creamer to your cup, the coffee was cold. The machines themselves only seem to last 2 years at the most before they either burn out the element, or the coffee starts to taste funky no matter how much you clean or run vinegar solution through it. It can't taste good unless it *smells* good. I finally figured it out. Most of what we think we are "tasting" we are actually *smelling. * We cannot taste without our sense of smell. Theoretically, percolating destroys coffee because it continually boils it. It boils the taste -- *and* the *aroma* -- out of it and into the air. That is why your entire house smells so good when a percolator is going; you smell coffee aroma in the air long before you even begin to pour it, let alone drink it. *Drip* coffee, on the other hand, may contain all of its "taste," but it does not release much of its aroma. Little aroma into your nose results in little effective taste. So, if you want the best coffee experience, drink *drip* while you are smelling percolated. I love my perc coffee my gram always had n used a farberware perc her coffee was the best.. my mother had mr. Coffee auto drips.. I've had several coffee makers and I finally got a perc.. mmm coffee never tasted so good again. Just like my grammys. I use 1 3rd less coffee in my percolator. That's a great way for me to save $$$. I have one of those old Corningware recalled for seperating handle, safty reasons. I got it in 1971. It still brews a great pot of coffee in about 9 min.. I love my percolator... I'm glad others on this site disagree with this post as well. The editor of this site and other experts claim that modern electric percolators boil the water. This makes absolutely no sense. If this were so, the only thing coming up the tube would be steam which is the result of water being boiled. If you watch the glass top of a percolator you will see it is WATER, not steam. Yes, it may boil at the bottom but as it travels up the tube and comes in contact with the lid you it turns back to liquid. Just think for a moment, how long would it take to make coffee if it was steam and not water. A little common sense will tell you that this is a myth. Now if one has an expensive drip machine that has precise temperature control and a good spray nozzle (like a Bunn) it would do an excellent job if you used non-bleached filter papers. But the vast majority of coffee makers do not have precise temperature and spray nozzle control. I am going back to our percolated coffee maker. We have tried various drip makers, and all seem to have a bland taste. Most were absolute coffee waisters, with poor saturation. I am tired of the amount of coffee needed in a drip to make a good full tasting cup of joe. Each time in the past when we went back to percolated, the taste was better, and our coffee bean consumption went down. As far as getting the right amount, coffee blend, and grind, this needs to be done with drip or percolated. The aroma is the icing on the cake with a percolator, and a good hot cup is also nice, without the use of a microwave. Are you kidding me? Percolated coffee retains all of the oils, all of the flavor. Nothing beats a good cup of percolated coffee in the morning (or any other time of day). Drip coffees are weak coffee flavored water in comparison! I just inherited my mom's old electric (Mirro? GE?) 9-cup electric percolator, and I'm hooked. I think the coffee has a much smoother edge than drip coffee. DH (who is the brewer in the family) cheerfully makes the perked coffee for me; for him, the only drawback is that it takes longer than a pot of drip coffee, but I think I can get him to make the switch permanent. I picked a 8 cup poly perk (of all things) at Savers for $5. I spent three days cleaning it with brew rite - maybe ten or more cycles. Followed directions that I found online. Ended up with an excellent brew. I may switch to percolated, maybe I'll by a new 12 cupper. It takes up less space. my drip coffee machine just broke so I had to get out an old perc pot that my aunt gave me. It worked so I had coffee, but the taste was not anywhere near as good as the drip! It tasted like an old cup of joe, not the strong wonderful coffee flavor I've come to enjoy. I only use organic coffees and I don't like it weak, but perculated coffee just can't cut it for the wonderful coffee flavor, not even close. I also enjoy coffee especially when I have it from a coffee shop or hotel, for the last year I have been drinking drip coffee but no matter how I changed the ammounts if coffee and water it was always bitter I even quit drinking coffee because it was so disgusting. I have just recenty switched to a percolater and it tastes so much better, I can enjoyy coffee again. I have always enjoyed perc over drip. I find the sound of the perculating familiar and calming. Maybe I am just old fashioned, but coffee to me is an event not just a thing to cross off my list during my day. I picked an old Pyrex percolator and tried it out using 100% arabica coffee, mid-priced, to see how it compared to my Mr. Coffee dripper. I was very pleased with the taste of the percolated coffee.I tasted a slight more bitterness, but overall, the flavors were more pronounced than the drip coffee I'm used to. I use coffee creamer, which masked the bitterness. Kind of reminded me of McD coffee, which always seems more bitter than mine at home. Agree. I switched from drip to percolated years ago, and still using the same percolator. My mom had one too, back in the 60's, and I remember stealing sips from her coffee cup as a kid. Even then the coffee tasted great. I recently tried to go back to drip, for the automatic timer, but decided to give away the coffee maker and pull the percolator from storgage. Maybe all that childhood caffiene caused some brain damage, but I don't believe what they say about percolators boiling and ruining the coffee. The taste is just not nearly as good, to me, brewed any other way - including French press. Percolators also offer some cost savings. No paper filters needed, and less coffee is required to brew a pot, vs. filter drip. Yet the flavor is richer, and yes, a little stonger. Depending on the coffee blend, and brand, you may have to play with a pot or two, adjusting your tablespoon levels, until you find the measurement that suits your taste. Once you do, you may be hooked for life. One last note. Concentrated coffee will continue to drip from the percolator basket after the coffee brews. Remember to remove the basket 4-5 minutes after the brew cycle completes to avoid an overly strong pot of Joe. The reason that percolator coffee is best or even french press for that matter is the hot water stays in contact with the beans longer releasing the natural oils of the coffee and making for a better cup. I roast my own coffee and percolator coffee is just more flavorful and more intense than drip. Making automatic drip coffee is like pouring hot water over a chicken and calling it soup. I feel that percolated coffee actually releases more nuances of flavor that does your typical drip pot. Not only that but the temperature of the coffee remains hotter for a longer duration of time.